As spectacular a mixed martial artist as Shina Aoki is, the Japanese sensation is equally the sport’s biggest enigma. While known for his boisterous personality and colorful attire, there’s a dark side to Aoki that he’s not always able to tame. He owns an impressive 23-4 professional record and has finished 14 of those via submission. Aoki’s last victory was by far his most controversial after his inner “demon” erupted on Mizuto Hirota at “Dynamite!! 2009” this past New Year’s Eve. The jiu jitsu wizard caught Hirota in a hammerlock in the opening ticks of their matchup. Although Aoki probably/most likely/definitely knew he was in position to break Hirota’s arm with the greatest of ease, Hirota refused to tap. 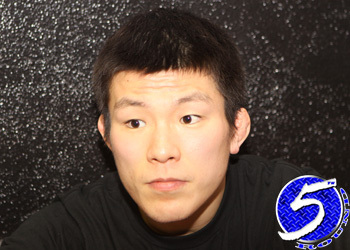 “I don’t regret anything about the fight,” Aoki told 5thRound.com through his interpreter. “Broken arms, they happen during a fight so the referee should have stopped that before it happened. While most didn’t take issue with Aoki snapping his bitter rival’s limb because it did occur legally during battle, it was his Brock Lesnar-esque antics afterwords that drew the ire of MMA purists. Although the lightweight claims something took charge of his body inside the Saitama Super Arena in Saitama, Japan, he’s of clear mind now and still doesn’t have remorse for what went down in the Orient. “I don’t regret anything about that night,” Aoki matter-of-factly stated. Aoki will challenge Strikeforce lightweight champion Gilbert Melendez for his strap this Saturday at “Strikeforce: Nashville.” The event marks the organization’s second CBS primetime broadcast, as well as Aoki’s stateside debut. Melendez just unified the 155-pound title when he dominated Josh Thomson at “Strikeforce: Evolution” in December. It was his third straight win, improving his record to a dominant 17-2. When asked if American fans would be forced to witness Aoki’s inner demons if he were to leave the Bridgestone Arena victorious, the controversial grappler made no promises.